your blog and enjoy the life you always dream of? get approved so they have made the process very hard. publishing and works at Pay Per Click system. earn huge amounts of money if we do our work in right way. their blogs and Google AdSense. among all the other available networks. the biggest reason it is so popular among bloggers. will reject your AdSense application. grammatical mistakes Google will reject the blog right away. Google AdSense if you want to get accepted. 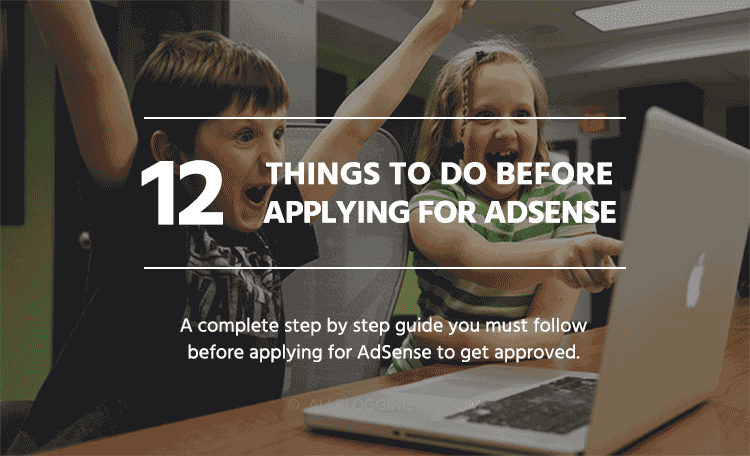 to do before applying for Google AdSense. thing which you can’t ignore at any cost. I mean it! policy for a blog doesn’t make sense but they are wrong! don’t have it you cannot get approval simple is that. get on your blog , what they should do and what they should not. (You don’t need a lawyer anyway). are not showing this page. What one of your readers likes may be bothering someone else. edited , what they liked or hated. your social profile links too. before you think about applying again for AdSense. applied for AdSense and not some spam, crappy bots. you’ll be able to enjoy fully approved AdSense account. Google AdSense? There is no confirmed answer. are enjoying making money with AdSense. views, and 2 comments. Isn’t that great? than 18. They write incorrect age and get into trouble. Because Google AdSense is not for people who are under 18.
times without any legitimate reason. professional and fast-loading design is appreciated by Google. When you visit a website what’s the first thing you look for? getting a premium theme from MyThemeShop. it is something that truly matters. get rid of these content. the domain from Godaddy or Namecheap. that’s focus more on helping your visitors. still consider applying for AdSense. months old blog. He managed his blog from mobile only. or anything, it’s time to drop them off. which usually takes anywhere from few days to weeks. sure to remove all the ads on your blog from any other network. sources like social media, search engines, and related blogs. used for the first time. closed so the other one will open. You can use these ad networks to earn money without AdSense. They are easy to get approved. ads, intext ads, inframe ads, intag ads. wants from its every publisher. to make money online without AdSense. affiliate marketing and selling your own product. with your friends, I’m sure they’ll love it! 0 Response to "Top 12 Things to Do Before Applying for Google ADSENSE With Your Blog"